“Six Weddings & A Dress.” This is an amazing true story about a wedding dress made for bride Chiyomi Ogawa, while held captive in the Manzanar Internment Camp. After WWII, Chiyomi’s dress was passed along to grace five Japanese American brides who had relocated to Pasadena to rebuild their lives. Pasadena native and resident, Wendy Fujihara Anderson (founder and producer of the popular 2002-2011 Cherry Blossom Festival SoCal) will present stories on the six Pasadena brides and a short film by Steve Nagano about the wedding dress that is indelibly woven into the history of Pasadena and bonded these six women. PASADENA ROTARY CLUB - Wednesday, September 26, 20018 at 12:00 noon at the University Club Pasadena, 175 N. Oakland, Pasadena, CA 91101 x Walnut, one block east of Los Robles. Complimentary Valet Parking. Buffet Lunch: $33.00 No RSVP required, pay at check in. RYUJIN TAIKO was formed as a creative outlet for taiko drumming with an emphasis for experimenting with modern ways to enhance the classical Japanese drums. Members performed with one of North American earliest taiko groups, as well as learned from some of the most reputable instructors in the community. This background has given them a well-rounded education in taiko form, and an understanding in the musicality of rhythmic instruments. 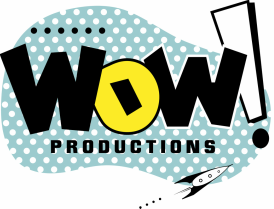 Ryujin's goal is to bring excitement and energy to our performances, as well as to connect with our audience and spark their interest in the in art of taiko and the Japanese culture. 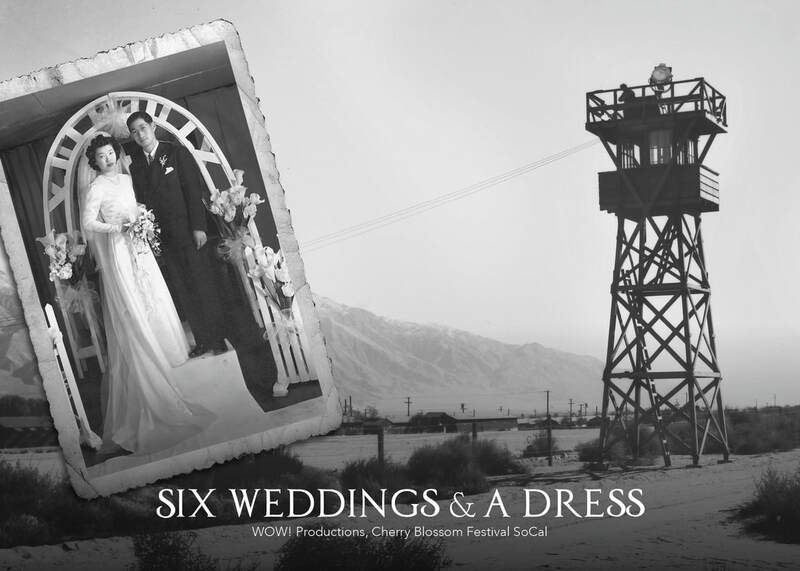 Pasadena Museum of History Presents: "SIX WEDDINGS & A DRESS"
PASADENA MUSEUM OF HISTORY Hosts: "Six Weddings & A Dress" presented by Wendy Fujihara Anderson on Tuesday 2/6/18 at 6:30. For the “Big Read”, Pasadena Public Library is inviting everyone to read, "When the Emperor Was Divine by Julia Otsuka." This book explores the experiences of a Japanese-American family during World War II. 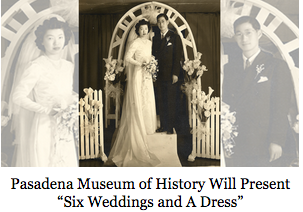 In conjunction, the Pasadena Museum of History (PMH) will present a unique Pasadena connection to this period in our nation’s history with the presentation of “Six Weddings & A Dress.” This is an amazing true story about a wedding dress made for bride Chiyomi Ogawa, while held captive in the Manzanar Internment Camp. After WWII, Chiyomi’s dress was passed along to grace five Japanese American brides who had relocated to Pasadena to rebuild their lives. Pasadena native and resident, Wendy Fujihara Anderson will present information on the six Pasadena brides and a short film by Steve Nagano about the wedding dress that is indelibly woven into the history of Pasadena and a rare chance to meet original bride Chiyomi in person. Pasadena Museum of History will also showcase materials from the archives related to this story including oral histories.